AFTER THE CIVIL WAR, Joseph and John LeConte left South Carolina College for California. They were outraged with the newly enforced laws of the post-Civil War state legislature that allowed newly freed slaves to attend the university. Today, their name adorns the math and statistics building. Evidence of a past riddled with racial discrimination and violence is littered around our campus and adorns our buildings. Just last month, a racist message to the black community was posted on the welcome board for the Center for African American Studies, prompting campus-wide outrage and reigniting the discussion for accountability and justice in the face of racism. Last year, Yale University asked both students and faculty to engage in this difficult discussion. Calhoun College was renamed due to South Carolina politician and Yale alumnus John C. Calhoun’s reputation as a secessionist and white supremacist. The conversation at Yale wasn’t about educating students and faculty on Calhoun’s legacy and moral code, but rather whether it matched up with Yale’s — it did not. Donaldson doesn’t think USC needs to take the same route as Yale. “There needs to be a more thorough history of the names of places on campus before we make a decision about renaming,” he says. Even if the university wanted to change the names of buildings, they could not. The South Carolina Heritage Act, passed in 2000, ensures that “no street, bridge, structure, park, reserve, or other public area of the state dedicated to, in the memory of, or named for any historical figure or historical event may be renamed or rededicated.” This is why university archivist Elizabeth West wants to educate the public instead of eradicating these histories. Sims is a national figure. The state health department is named for him, and his statue sits on the State House grounds and in New York City, where he practiced medicine for most of his career. The Washington Post reported on the fight to remove Sims’ statue in New York City after alt-right protests in Charlottesville this summer sparked activists to look into the historical figures dotting our public places. Columbia Mayor Steve Benjamin told Chris Matthews that the Sims statue on the State House grounds offends him more than any Confederate memorial. “Why was an all-women’s dorm named after a very prominent male slave owner?” Donaldson asks. Two of the dorms making up women’s quad are named for such men: Sims and Wade Hampton. Sims was not only a slave owner, but also a physician who performed on non-consenting slave women he kept in a locked building connected to his workroom. His lab rats were “on loan” from fellow slave owners. The dormitory was constructed and dedicated in 1939. “At the time, they (the Board of Trustees) didn’t think the female graduates — who started attending the university during the 1890s — had the prominence that some other alumni did,” West guesses at the board’s choice. Randall pushes for education, especially on the most off-putting building names. Signage and education “serves as a reminder that many of our buildings on campus are named for people we should not blindly laud,” she says. Sims, a man who thought himself to be a hero, has now come to be known as a cruel scientist. Without admitting his transgressions and refusing to acknowledge the atrocities he committed, we regard Sims as the hero. Thomas Cooper was an abolitionist-turned-slavery defender who introduced South Carolina to the idea of states’ rights and nullification. Today, we spend hours in the sprawling library named after him. Looking ahead, the South Carolina Heritage Act greatly hinders the chance to change building names, but Donaldson offers an alternative: “We need a new interpretation of these places, of these people.” But if the recent additions to the Horseshoe are any indication (the plaques commemorating enslaved men and women who built South Carolina College), the university’s attempts may not be as complete as some would wish. Nonetheless, the first step is acknowledgement, which the administration has begun to do. 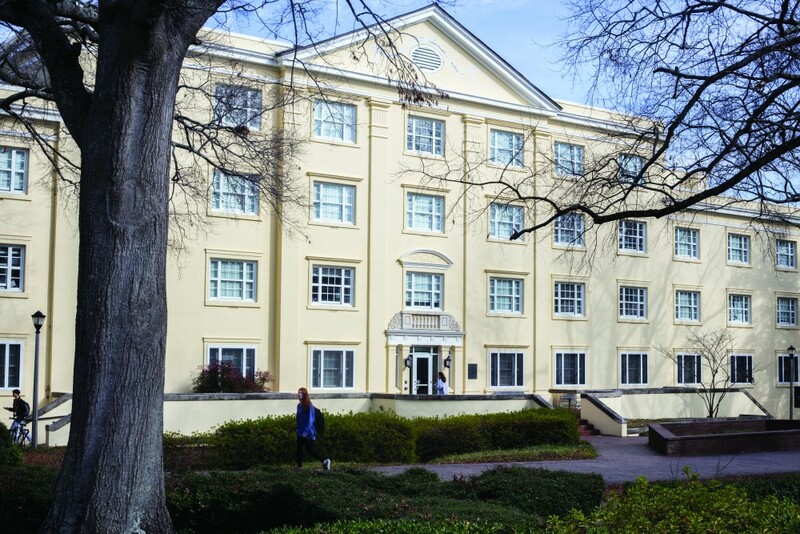 Only three buildings on campus are named for women: the Darla Moore School of Business, McClintock Hall, and Russell House, which was named for the former USC president and his wife. Only one is named for a person of color: Booker T. Washington. In the next phase of expansion, the university should cast a wider net outside of its usual pool and look for people who truly represent the diverse university we have evolved into, like George W. Murray, a prominent civil rights activist who was born a slave and died a respected senator and educator. But if the past year has taught us anything, it’s that facing the ugliness of the truth is vital to progress. The Silence Breakers told their stories of assault, the immigration bans and talks of a Mexican Wall found people across the country opening their arms to immigrants and refugees, and the vile face of white nationalism in Charlottesville and across social media has prompted another fight for equality and justice. Sen. Strom Thurmond was a longtime senator and Dixiecrat who passionately fought to stop the 1957 Civil Rights Bill and known sexual harasser. Today, his name sits upon one of the largest fitness and wellness centers on any American college campus. “Things like this tend to build in different areas of the campus, and then they all hit the right moment with student involvement,” West says. The recent push by students and faculty, especially the 2020 Vision team, have forced administration to address the issue. It’s time to confront the past. Not to rewrite it, but to acknowledge the ugliness of what these men did, so we can start a dialogue about how we — the students, the faculty, the university, the state, the nation — can move toward a future that is not clouded by the sins of our past. Thank you to university archivist Elizabeth West for her invaluable help ensuring historical accuracy and providing the historical photographs.